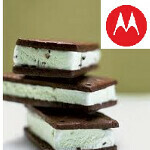 Motorola explained on its blog, the process by which it plans on updating some of its handsets to Android 4.0. The entire process takes about four steps and it could be 4 to 6 months before your phone is running Ice Cream Sandwich. The first step involves taking the source code and sending it to devices via updates to devices where they can work well, at the same time, making sure that carrier requirements are met. What Motorola calls its "silicon partners" like TI, Qualcomm and NVIDIA must "adapt this to their chipsets in parallel and we incorporate these as they become available." Motorola specific enhancements like MotoCast and Smart Actions are added to the source code in this step. Step 2 prepares the update for the carrier's certification lab by testing its quality and stability. Bugs are removed in this process. After as much as a 2 month preparation cycle, the carrier's lab tests the update which could take 1 to 3 months. At this point in the process, Motorola conducts tests with customers to make sure that the update is working right. This is the so-called "soak test". The final step is to release the update. According to Motorola, deciding which phones will receive it is based on factors like the capabilities of the hardware and the device, the software support for the chipset on the phone and the ability to support "the Motorola value add software". Adding it all up, it comes out to about 4 to 6 months to complete the process. Google has released the source code for Ice Cream Sandwich and Motorola is checking it out. The devices that will definitely get Android 4.0 at the moment are the Motorola DROID RAZR, the Motorola DROID BIONIC, and the Motorola XOOM (including Family Edition). Have a Motorola phone that you are hoping will be running on the ICS update? Motorola hopes to announce the other devices that will be updated sometime next month. gnex? I'm sorry, what is that? I don't ever remember hearing six weeks... I remember hearing Q1 of 2012 but that's it. u r right. They promised to release 6 weeks after source code for ICS was released. Assuming GN releases in next 2 weeks... folks who bought Droid Razr will feel cheated. But this should change in future when google takes over Moto. well shoot HASHCODE should have ICS on phones here soon. I know he's already got it on his droid 3 but he's working out the bugs now. So what happens first ICS on another device or Verizon finally releases the Galaxy Nexus? Nice to see my DX2 has been abandoned after 6 months. So lame. Glad I finally switched to the iPhone - at least it will get updates. "Glad I finally switched to the iPhone - at least it will get updates." I doubt the owners of 3GS and 4 models will agree with your statement if they were wanting some Siri love. Owners of 2+ year old 3GS's got the iOS 5 update (without Siri). That's still a lot more than can be said about any Android phone. Motorola won't even unlock the DX2's bootloader so they can develop Cyanogen for it. And what if Moto releases ICS for the Droid 1? There are rumblings to that effect on the Droid forums. Moto has been soliciting D1 owners for participation in saturation testing; once accepted, everything else is under NDA, so no project details as yet. Now what was that you were saying about Moto abandoning earlier products? they may have got the update but god did it slow the phone down. IOS is now fragmented because the 3g and 3gs could not handle ios5. What updates did android need to keep bring out? No really how stupid are you? Android had gingerbread this year and will have ICS next year. Only reason to keep releasing updates if there are issues with the last update or software. Google said they want to do a once a year update process. This whole post is about the ICS updates. Read the post before you make witless comments. What your saying is you got a iphone for updates. Have u not read about all the iphone updates? Their to correct the issues with the previous updates, if u like getting updates with problems that need more updates to fix them then you made the right choice. This is about Google getting ICS to maufactors who need to test the updated OS and then pass it to the carrier, then finally after everything is said and done, release it to the public. Dont fix something that isnt broke. He said he ditched his droid for a iphone becuase of updates. Only phone i know that had a issue in not getting a major update on time is the US galaxy S series phone. I dont see how Apple updates to a major update once a year is better then a Android major update once a year. Google shows off the features off the update then sends out the sorce code to be tested and made into a update. For him to say he made his change because of a update is a poor excuse to use. So much for Q1 for ICS :( Figures, it was to good to be true. Q2 here we come...lame. I hope the Photon 4G gets it. Can't say I'm surprised considering how much of a major update ics is. I can't blame them for wanting to make sure it works properly. totally with you. i want the update for the first motorola atrix. They need to release ICS on both the Atrix and the atrix2. Well, my RAZR is rooted and I can tether without Verizon pestering me. At least I have my captivate for my flashing needs....ICS is looking good on that phone, so far.